Egg-based flu vaccines might offer less protection against this year’s major flu strain, FDA chief Scott Gottlieb admitted during a House hearing Thursday, but they’re unlikely to go out of style just yet. In a speech made to Congress Thursday, US Food and Drug Administration chief Scott Gottlieb took stock of how his agency handled the ongoing, record-breaking flu season this winter, as well as discussed the future of flu vaccination in the US. Among other tidbits, Gottlieb made clear that it’s going to be a long while before we can even think of seeing a flu vaccine that can broadly protect against any strain. Gottlieb was among several to offer testimony at a hearing held by the US House Committee on Energy and Commerce—specifically its Subcommittee on Oversight and Investigations—examining how the government’s public health agencies had fared during the current flu season. Other speakers included Anne Schuchat, the acting chief of the Centers for Disease Control and Prevention, and Anthony S. Fauci, the long-standing director of the National Institute of Allergy and Infectious Diseases. Early data has found that this year’s vaccine is around 36 percent effective against the flu overall; and only around 25 percent effective against the most predominant strain, H3N2, in circulation. The vaccine does seem to be more effective against the remaining A and B virus strains around, as well as among younger children. H3N2 is notoriously difficult to protect against in the first place, thanks to its quicker rate of mutation, but scientists have speculated that the traditional process of vaccine production may only be worsening our defenses. 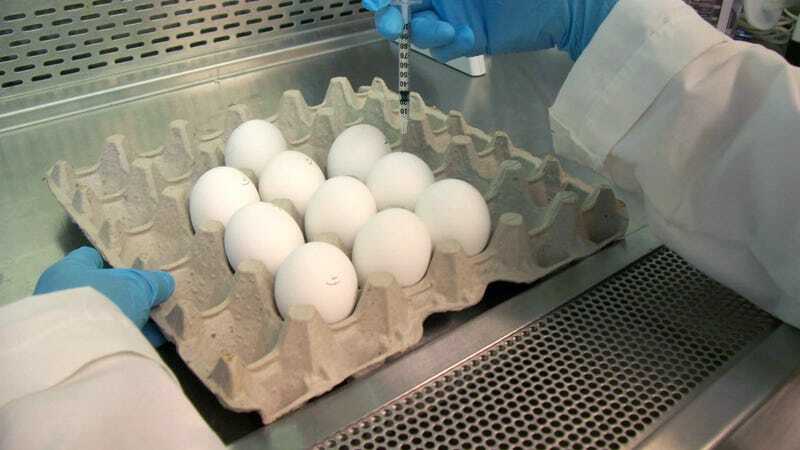 There’s evidence that H3N2 viruses grown inside eggs that are used to make the vaccines develop tiny changes that make the vaccine more incompatible against H3N2 strains in the wild. Newer technologies that allow vaccine strains to grow inside cells seem to have less of this problem, though. And indeed, the CDC has found evidence that people given cell-based vaccines this year were better protected against H3N2. Gottlieb defended the use of egg-based vaccines this year, noting that they have long been tested to be safe and effective. He also said that vaccine makers aren’t necessarily eager to switch to a cell-based model, thanks to the “enormous investment” it would take to fundamentally change the manufacturing process. “However, we believe it’s worth better understanding the potential of cell-based and recombinant alternatives,” he added. To that end, the agency plans to conduct its own analysis of vaccine effectiveness rates among Medicare patients between differing vaccine types. And it will also ramp up efforts to make cell-based vaccines cheaper and quicker to produce. As for how the flu season is looking right now: The CDC announced this week that only 3.7 percent of doctor visits were related to flu-like symptoms during the first week of March—a drop from the 4.9 percent seen the week before, and a sharp drop down from the peak of 7.5 percent seen in early February. Over the past five seasons, it took 16 weeks on average for visits to drop down to the normal baseline rate of 2.2 percent. While that’s the week we’re in right now, though, this season is expected to last longer, possibly even into mid-April. Currently, the flu remains widespread across 21 states.